The hotels are very comfortable (a mix of 3 and 4 star) in Seeham, Mondsee, Traunkirchen/Ebensee, Bad Goisern/Bad Ischl, Abersee/St Wolfgang and Salzburg. Most hotels have saunas and some have swimming pools. 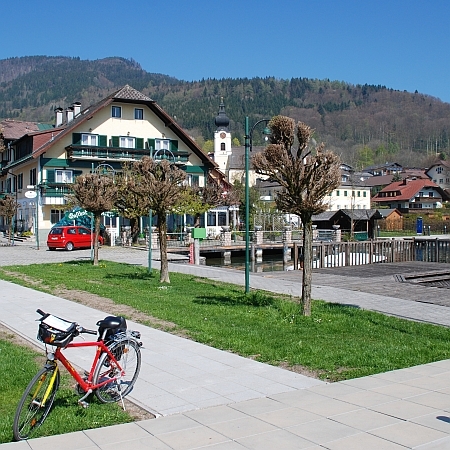 Starting and finishing in the wonderful city of Salzburg, this is a marvellous cycle tour of the stunningly beautiful Salzkammergut, the Austrian Lake District. The cycling ranges from flat lakeside tracks to quiet country lanes across scenic rolling hills, with train and boats taking the strain. Travel to Salzburg and take the opportunity to explore this vibrant city with its musical connections before the tour briefing and distribution of bikes. You leave Salzburg following the river Salzach north west to Oberndorf where, at the ‘Stille Nacht Chapel’, the Christmas carol ‘Silent Night’ was first performed in 1818. 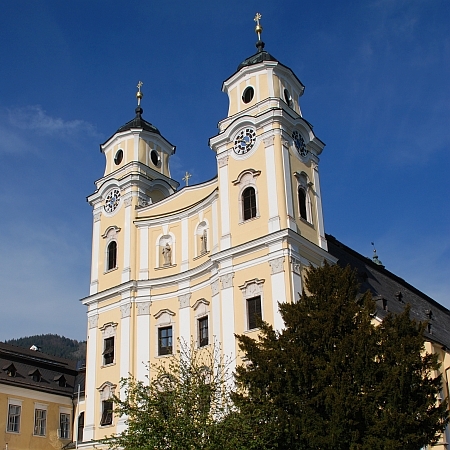 There is chance to visit Michaelbeuern Abbey before your overnight stop at the lakeside village of Seeham. Passing a nature reserve by the small Egel Lakes, you reach the rich dairy production area of Schleedorf. The route is through rolling green pastures also passing Wallersee (Lake Wallersee) and alongside Zellersee (Zeller Lake) towards to your overnight accommodation in the lovely town of Mondsee. 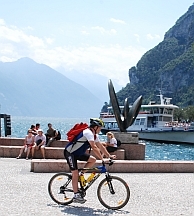 You start this full day with a cycle ride alongside Lake Mondsee and onwards to Unterach where you take the cycles on a boat and cruise along Lake Attersee to Weyregg* (included in tour price). 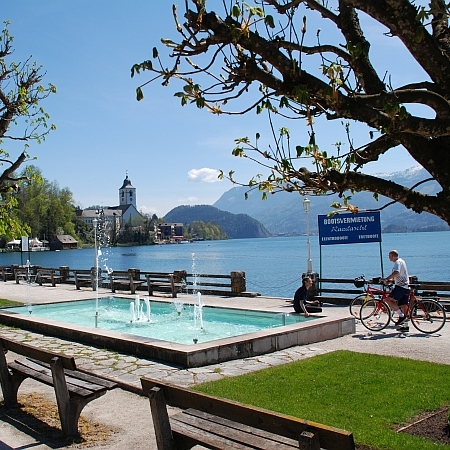 You then cycle through the picturesque area of Aurachtal to Traunsee (Lake Traunsee) at Gmunden, famed for its pretty ceramics (see the ceramic carillon at the Town Hall) and historic connections with salt trading. You then head south along Traunsee passing Castle Ort, which sits in splendid isolation out in the lake, before reaching your overnight accommodation at picturesque Traunkirchen or Ebensee. 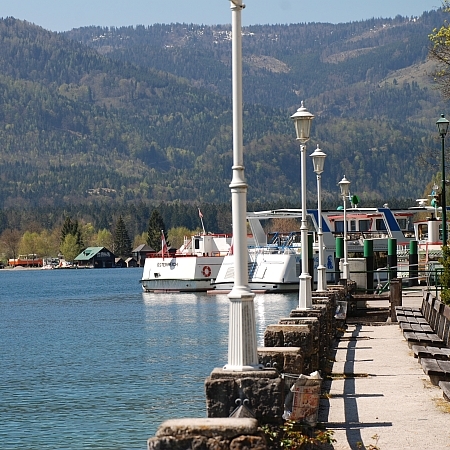 *Ferry on Lake Attersee only available July & August (and perhaps a few days either side). 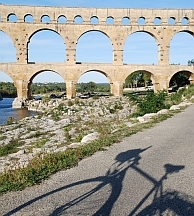 Outside this period, the route has 10 miles additional cycling. After a short cycle ride alongside Traunsee, you let the train take the strain and transfer with your bicycles up to Obertraun (included in the price) on the eastern shore of Hallstattersee (Lake Hallstatt). 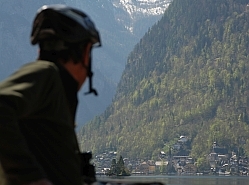 You then cycle beneath the imposing mountains and skirt the southern fringe of the lake to the town of Hallstatt, a UNESCO World Heritage site because of its beauty. You may choose to visit some of the interesting caves (Giant Ice Cave, the gigantic Mammut Cave) which are situated nearby. 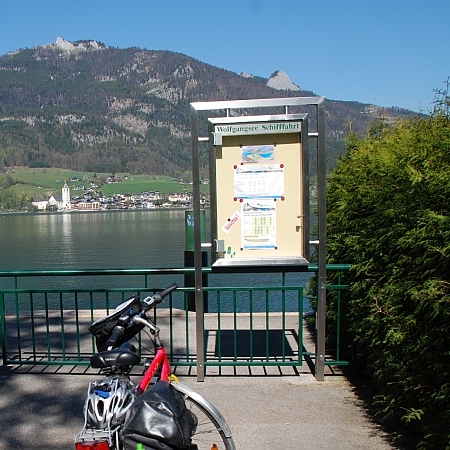 You re-trace your route to Obertraun and then follow the new cycle path along the eastern shore of the lake to St Agatha (in high season it is possible to use the lake ferry from Hallstatt to St Agatha should you prefer). 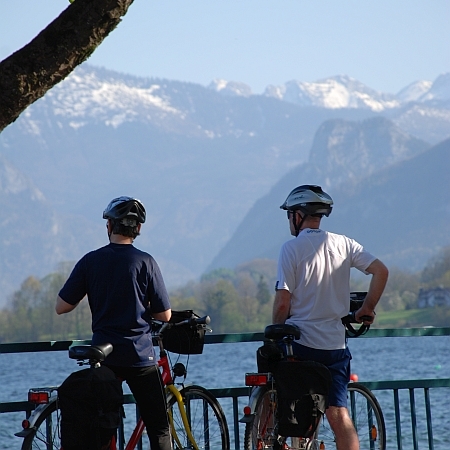 The journey concludes with a short ride to your accommodation in Bad Goisern or Bad Ischl. Day Six – Running short of superlatives yet? Take some time to enjoy the spa town of Bad Ischl where you can visit the Kaiservilla, the summer residence of Emperor Franz Joseph, enjoy a pastry and perhaps take the cable car up to take in the panoramic views. Just as you are running short of scenic superlatives, after a short ride you reach Wolfgangsee (Lake Wolfgang); framed by mountains, it is considered by many to be the prettiest lake in the Salzkammergut and it is also the warmest. Your hotel is at St Wolfgang or close to the lake shore at Abersee, which enjoys the lovely views back across to the pilgrim’s church in St Wolfgang. 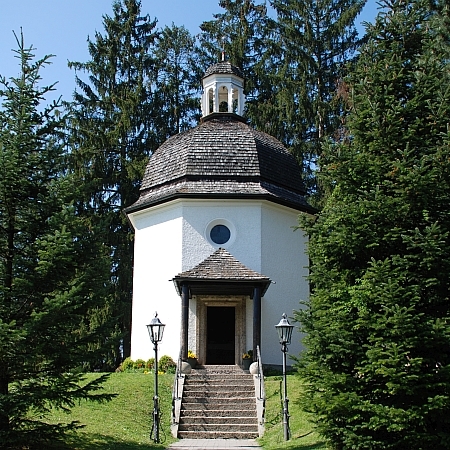 Today commences with a short cycle ride to St. Gilgen, the home of Mozart’s grandfather, and where, in the parish church, Mozart’s’ mother was christened on the day she was born. Here you leave your bikes for an hour or so for a 2km hike up the hill to a rendezvous at Kuhleiten (the transfer of the bikes up the hill is included in tour price). 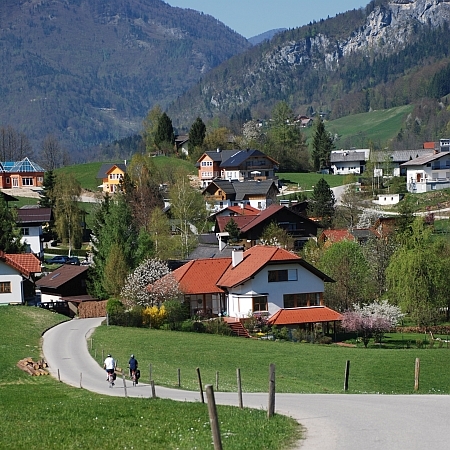 This enables a downhill ride to Lake Hintersee which is followed by the Strubklamm gorge. A short hop then across to the Salzachtal valley and back to Salzburg, with the chance to see the fascinating fountains at the Summer Palace of Hellbrunn on the way. 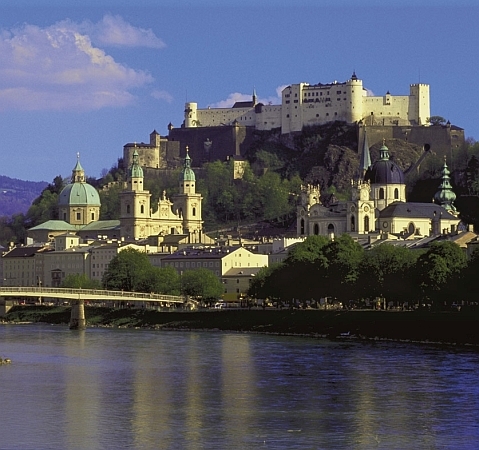 If you would like longer to soak up the atmosphere in Salzburg, perhaps in search of Mozart or to take a tour of the filming locations for The Sound of Music, we would be happy to arrange additional nights in Salzburg, either before or after your cycle trip. 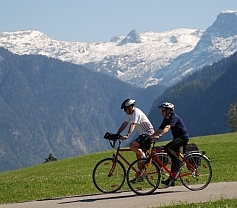 Alternatively combine this with one of the River Mur holidays for an unforgettable Austrian cycling experience.